Here's the gist: you buy a phone base that includes the motherboard and enough connective hardware to string all the parts together on one side and mount the screen on the other. The back is full of holes with electrical contacts, sort of like that big green LEGO baseboard you played with before the company turned into an alternate action figure line for superheroes and Harry Potter. Plug in the components you want on the back, grab a screen for the front, and turn it on. Wam bam, you've got a complete and working smartphone with components that can be upgraded by end users at any time. The really interesting bit (and one of the biggest problems with the idea) is that the components can be reconfigured in an infinite number of combinations on the back of the phone. If you never use Bluetooth or WiFi but you listen to music all the time, toss out the extra wireless modules and swap in a bigger speaker. If you use almost zero local storage but you tend to spend days away from a wall outlet, plug in a tiny 2GB storage module and a massive battery pack. 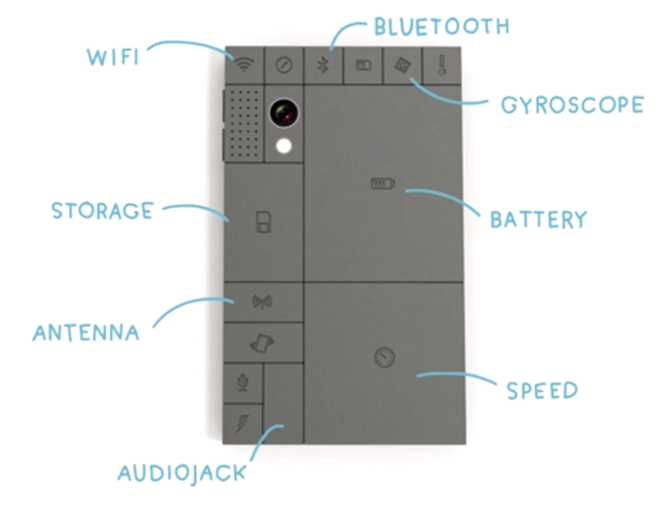 The video proposes that different manufacturers could make modules that all work seamlessly with the Phonebloks base, which suggests that designer Dave Hakkens never had a cell phone in the early 2000s, when finding a compatible charger at the airport was impossible. The fundamental design is also more than a tad bit optimistic. I'm no electrical engineer, but I know that it's no small task to create a system of contacts that will work for a processor, battery, wireless modules, and flash storage interchangeably. Getting it all to work with zero soldering seems unlikely, and I get the impression that the phone would fly apart like a meticulously-crafted Gundam figurine the moment you drop it. The basic idea of swappable parts means that any of these phones would be gigantic by today's standards. And lastly, what happens if the exact combination of wireless, processor, memory, storage, camera, and battery modules you want won't fit into a neat rectangle? Will you just fill in the empty space with blank hunks of plastic? Don't let any of this naysaying detract from the concept. It's a great idea, I just don't think it's entirely compatible with the way that mobile hardware works at the moment. But the idea of swappable, upgradeable modules definitely has merit - hell, it's the reason that some people still refuse to buy phones without a MicroSD card slot or removable battery. Creating an upgradeable system for flash storage (or cameras, or speakers, or basically anything that isn't soldered to the system board) is not an impossible dream. Whether or not phone manufacturers and OEMs will play along is another matter. After all, they're probably just hunky dory with the wasteful upgrade cycle as it stands. 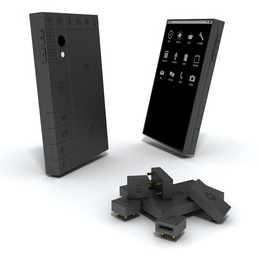 The Phonebloks project is organizing a mass social media push on October 29th to give the idea a ton of exposure and hopefully get some hardware and software vendors on board. If you'd like to join in, head on over to the Thunderclap.it page and sign up. The project website seems to be down at the moment. Source: YouTube - thanks, Michael Crider!